I've heard that washing machine motors (in particular, the Fisher & Paykel branded ones which are local to me in New Zealand) are quite suitable for repurposing for generation use. How can I determine which motors might be the most appropriate for a particular use, with regards to repurposing as a generator? The electricity generated might be used to charge batteries, or with larger motors, even contribute towards a household. I want to keep this question general with regards to the type of use, so I can understand how to choose a motor to work with. DC motors: The most suitable motors are those which have permanent magnets in their rotors. Traditionally these were pure DC motors - where DC was fed into the motor rather than AC such as is obtained from AC mains or via a transformer, but the boundary has become blurred as a BLDC motor or BLDCM = "Brushless DC Motor" uses electronics to take supplied DC and create required AC fields. Alternators and generators: Also suitable are devices intended originally for power generation rather than as motors. A car alternator is in this class. Due to industry attempts to lower cost a car alternator is harder to use in some applications than eg a BLDCM. Induction motors: These are the majority of appliance motors in the 1/4HP (200 Watt) to several HP (2000 W +) range. These are generally NOT considered suitable but in many cases could be used with suitable expertise. There are usually enough alternatives available to make the use of induction motors unattractive. Of the list you provided the following are DC motors which can be used either directly or with minor changes. Washing machine motors - BLDC with magnets - yes. Induction motors - not really. 'stepper motors' from computer equipment. The details can be complex so this is a quick summary. I can provide as much information as desired if more questions are asked. "Brushed" DC motors are easiest to use to create DC as DC appears at their terminals when they are rotated. Battery powered appliances are often in this class. Some appliances with brushed DC motors have a speed controller between the terminals and motor which may isolate the motor when used as a generator. eg a battery powered electric drill will almost always be speed controlled so you need to access the motor wires directly to use it as a generator. Whereas a battery powered line trimmer which operates at a single (full) speed may provide direct access from battery terminals via a switch to the motor terminals. Treadmill motor are often large brushed DC motors - you'll need to access their terminals directly. Power ratings up to several horsepower are possible. Small "stepper motors" such as are found in older floppy disk drives and older hard disk drives and some printers will produce AC at their terminals when the shaft is rotated. This sort of motor usually "announces itself" by having a jerky "cogging" action when turned as the stator successively try to trap each rotor magnet as it passes. Large "BLCDM"s are found in some washing machines. One such are the Fisher & Paykel "Smartdrive" motors - originally made in NZ but sold in many countries and bought by Haier a year or so ago. Well known by wind turbine makers. Also used in some hydro systems. Many photos of them here. 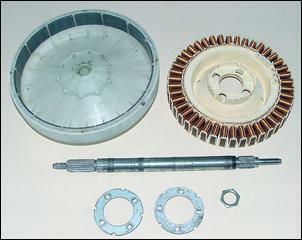 Note magnets in rotor and many coils of wire on stator. These are wound as 3 phases and there is much discussion on web re reconnecting these to achieve various desired results. The magnets are relatively low grade ferrite due to the low cost - F&P evidently decided they could get value for money performance wise with lower cost magnetics and more effort in overall size, laminations, copper used etc. 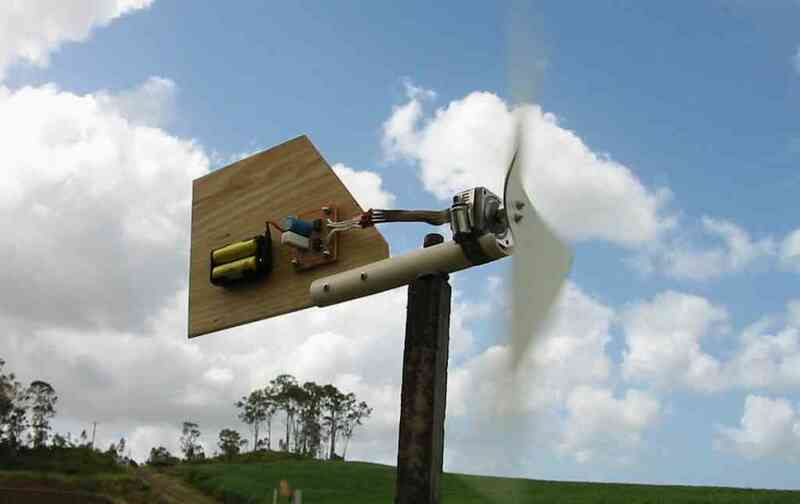 Search for eg ... smart drive windmill ... for many pages related. Using an older style (5.25") floppy disk drive stepper-motor directly. Power output is only a few Watts. Stepper motor is "coggy" due to magnetic attraction to stator poles and does not start well in low wind. Not the answer you're looking for? Browse other questions tagged electricity wind-power electricity-generation or ask your own question. At what point are home windmills sustainable?